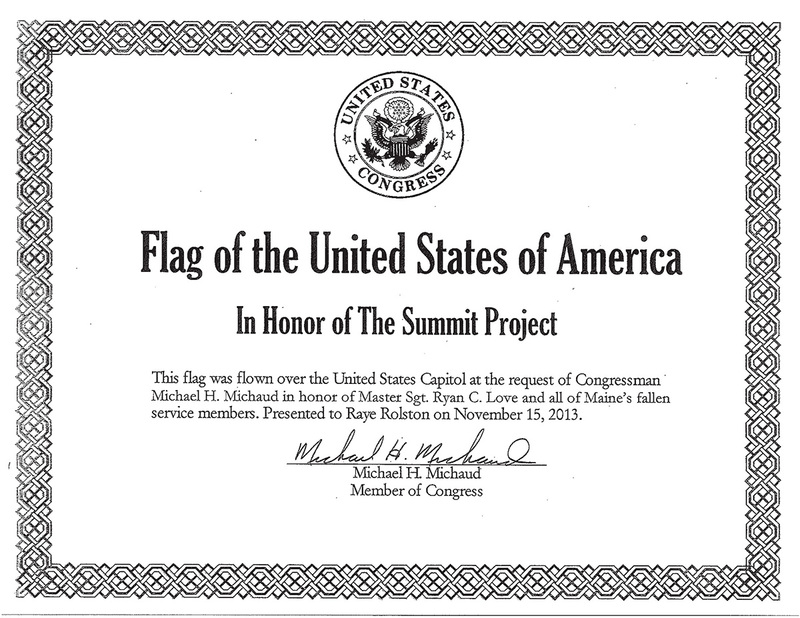 “The Summit Project” pays tribute to fallen service members from Maine who have died since September 11th. A Maine native created the memorial by asking families of these heroes to donate a special stone that represents their fallen loved one. Monday, these engraved stones traveled in the Bangor-Brewer Veterans Day Parade with the Marine Corps League. “It’s an awesome and honoring experience. It’s one I was glad we were able to do today,” said Joe Fisher, a member of the Marine Corps League. “It was an honor beyond belief. I’m a Vietnam veteran and to be able to walk with these stones was like walking in the shadow of fallen comrades,” said Dwight McIntosh, another Marine Corps League member. “This is truly a living memorial. These stones and the spirit and the stories of our fallen heroes are very much alive and it’s what the families want for us, not to forget about our fallen comrades,” said Major David Cote, “The Summit Project” creator. Maj. Cote is an active duty U.S. Marine Corps officer who now lives in Arlington. He flew back to his home state for the parade to share the project with the community. Read more here. A U.S. Marine Corps major from Maine has created a way for fallen heroes to pass on their legacies. WMTW News 8’s Aly Myles reports. Watch the video here. PORTLAND, Maine —A major in the U.S. Marine Corps with ties to Maine is honoring the state’s fallen soldiers. Maj. David Cote said he wants the families of the soldiers to know their loved ones’ sacrifice will live on forever. Click here for pictures of the stones. It is called the Summit Project, and it started as a dream to honor every Maine fallen hero, but now the project is a living memorial that has no end in sight. Each family that wants to be a part of the Summit Project gives Cote a stone that means something to their fallen soldier. The stone is engraved with the soldier’s initials, rank and years they were alive. “Anything we can do for our soldiers at home or overseas, we’re going to do,” said Charles Downes who is donating engraving services to the Summit Project. For the families, the project means much more. Read more here. Watch the video here. Each month, Sarah and Dustin Smiley invite a new guest to have dinner with them and their three sons. You can read more about the project here. David Cote has been described by some who know him as “the state of Maine’s greatest export.” A go-getter since he started his own paper route at the age of eight (“That’s younger than me,” my middle son, Owen, 10, said) and became an Eagle Scout in high school, David, a Major in the Marine Corps, is now embarking on his biggest and most important feat: The Summit Project. The Summit Project is a living memorial to honor every service member from Maine who has died since 9/11. The families of these service members select a rock from a special location, and David has it engraved with the service member’s initials and birth- and death- years. On Memorial Day 2014, he and a team of hikers will carry the rocks up Mt. Katahdin, Maine’s tallest mountain and the end of the Appalachian Trail. Then they will carry the rocks back down so that more hikers can do the same for years to come. According to David, “We will honor the fallen by challenging the living.” (Some of the rocks are close to 20 pounds.) Read more here. As the nation prepares to mark a solemn anniversary this Wednesday, a serving military officer from Maine is planning a unique way of memorializing the several dozen Mainers who have died serving their country since 9/11. Marine corps Maj. David Cote – originally from Waterville, Maine – is putting a together a collection of stones, each of them engraved with the details of one of the 46 Mainers who fallen in combat since 9/11 – mostly in Iraq and Afghanistan. On Memorial Day next year, he plans to lead a hike to the summit of Mount Katahdin, Maine’s highest peak, where a temporary memorial will be constructed from the stones. Tom Porter spoke with Maj. Cote about the project. more…..
Bucksport – Maine heroes are not forgotten. That’s the message Maine native Maj. David Cote is sending with The Summit Project. Cote and his brother plan to remember Maine’s fallen by hiking up Mt. Katahdin on Memorial Day of 2014. The engraved stones, representing those who lost their lives, will also make the trek to the top of the mountain. A Maine native has come up with a project to honor fallen veterans who lost their lives in Iraq and Afghanistan. While the project is still evolving, he hopes to gather support for it. He calls it “The Summit Project,” and his plan, to get a group to hike up Mt. Katahdin next Memorial Day with stones given to him by families of fallen Maine soldiers. “I think that this idea of hiking a stone which represents the fallen is kind of a metaphor of bearing a cross. Making a small sacrifice because they made the ultimate sacrifice,” said Maj. David Cote, “The Summit Project” creator. Cote thought of the idea on Memorial Day when his Navy Seal friends honored their fallen comrades by leaving stones on top of a mountain in California. While the active duty Marine Corps officer now lives in Arlington, he wants to honor those from a place he calls home. Maj. David Cote hopes to honor the 46 Mainers who have died in the war on terror with engraved rocks atop the state’s tallest mountain. If his project goes according to plan, it won’t look like a memorial, but just a pile of rocks similar to the many others that mark the trails leading to Maine’s highest peak, Mount Katahdin. His plan still needs the approval of Baxter State Park officials, which is unlikely to happen, but right now he is trying to spread the word this Memorial Day in hopes that his vision will be a reality by Memorial Day 2014. more…. BANGOR, Maine — U.S. Marine Corps Maj. David Cote said he always wanted to do something to memorialize Mainers who died in combat. With Memorial Day approaching, he now has a plan. Cote, a 1997 Bangor High School graduate, is organizing an effort to have families or representatives of fallen military personnel engrave small stones and place them on Mount Katahdin in Baxter State Park. Cote said he’s focusing on memorializing those who died in the wars in Iraq and Afghanistan — Operation Enduring Freedom, Operation Iraqi Freedom and Operation Red Dawn — because there are few such monuments to them. more….